On 18th of February IMCO started its discussion for the proposal in its Working Document. We worked at once on this paper and sent our comments in time on the 9th of March. No law can reduce the abuse of firearms to nil. The Directive of 1991 is so good that the recorded cases with registered firearms are insignificant in regards to crime and transfer to illicit ownership by theft or unauthorized delivery in most MS. Criminals use mostly firearms which are not in the scope of the actual directive: smuggled firearms, thefts from military depots and reactivated, formerly converted firearms. The high priorities of the evaluation was easement for free movement of authorised firearms. The high priorities of the study to combat illicit trafficking was closer cooperation and legally-binding common minimum standards for definition of criminal offences and their sanctions related to illicit arms trafficking.The latter study reported that the great majority of illicit firearms circulating in the EU originate from cross-border trafficking activities. We support balanced regulations to close loopholes and united prosecution of illicit trafficking. We reject regulations which costs for administration, legal owners, manufacturers and traders are unbalanced, e.g. high costs but insignificantly small impact on security. 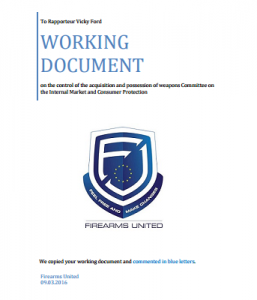 Update on 15-05-2016: The Committee on the Internal Market and Consumer Protection (IMCO) published 847 amendments for the EU Firearms Directive.